Late afternoon finds you wearily but happily trudging into the little village that will be home for the night. Thrilled to have secured a bed in one of the local albergues (special pilgrim-only hostels), you strip off the sticky, synthetic clothes, no longer caring about discretion, and head for the communal showers in your quick-dry towel. Inspired by the European pilgrims who live up to their reputation of feeling more than comfortable en deshabille, you come to appreciate varying body shapes and sizes and that all of them have made it this far with you. You wonder why you never thought to love your own body for its capability to get you from here to there before. You decide to start. In gratitude, you let the hot water gush over you and your aching muscles and you let out sounds usually reserved for other activities. Clean and fresh, you seek out a sunny spot with the company of your journal, or gather a few pilgrims and head out to the local bar for a cana of beer or local wine and tapas. 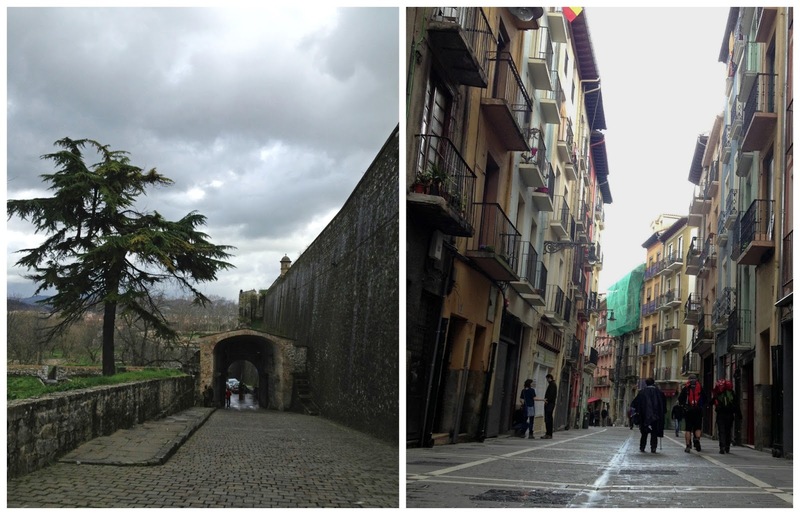 One of the major city stops on the Camino Frances is Pamplona. Surrounded by a great wall that proudly holds in its history, its culture, and its running bulls, Pamplona is home to some of the best tapas, or pinchas, Spain has to offer. You might find yourself lucky to walk with some Spaniards who know the city and can speak to her like a man in love, taking you deeper into her city streets to where the locals feast. You put your money in the pot and your faith in their selections and are not disappointed when they bring four or five offerings to the table, splitting them lustily into sections to share. You bite into a fritter of sorts, topped with a roasted pepper and tied with a grilled spring onion; warm goat cheese oozing out its split seams. You are entranced by the earthy pile of garlic-marinated mushrooms perched on a square of fried bread paved with thinly sliced cured jamon. You brave the heap of caramelized bits of crumbled blood sausage glistening with olive oil and then happily eat the segment someone else wasn't brave enough to try. And then someone places a plate of gulas in front of you and you are never the same again. Gulas is a regional specialty - a base of fried bread with the typical tile of jamon, piled almost indecently with what you think are baby eels, but are actually noodles made with a fish paste cut to look like baby eels. The noodles are tossed in garlic-infused olive oil, sprinkled with a touch of parsley and a shrug of lemon juice, and topped with a plump shrimp. After the first bite takes you to all sorts of indecent and amazing places, you desperately lower your lashes and do your best to find a bit of cleavage in your fleece so that the last piece is all yours. Your fingers skate across the oily plate as though hypnotized, seeking out any slippery vestiges of noodles that didn't quite make the journey from plate to mouth. 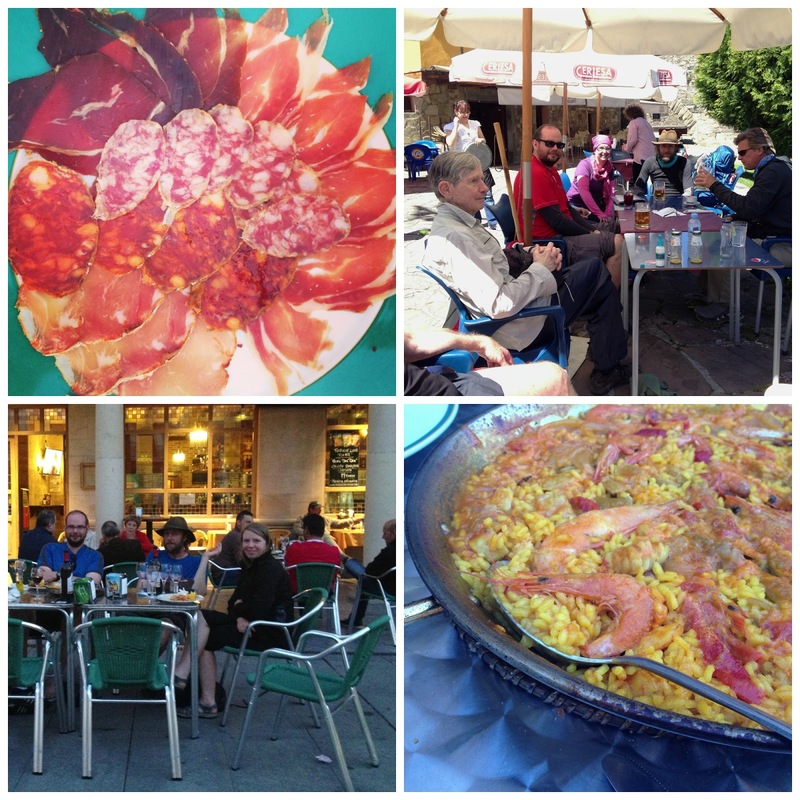 Dinner is a gustatory gamble on the Camino. You might find yourself eating the same tired piece of dry pork filet and a few listless leaves of lettuce masquerading as salad. Or, you might find yourself nestled in a cozy corner of a family-run restaurant eating food that has been planted, picked, cooked and served with enough love to last you all the way to Santiago. It certainly helps if you are slurping up the hearty vegetable stew, house-made sausage in spicy sofrito, and creamy vanilla custard with a gorgeous Brazilian flamenco dancer/doctor. She waves her spoon in the air like a castanet and shows you more about being a woman over three courses and a bottle of very good and very local Rioja than you have ever learned anywhere else. On most nights, the less-appealing dinners are easily glossed over with the bottle of wine that accompanies each pilgrim menu. 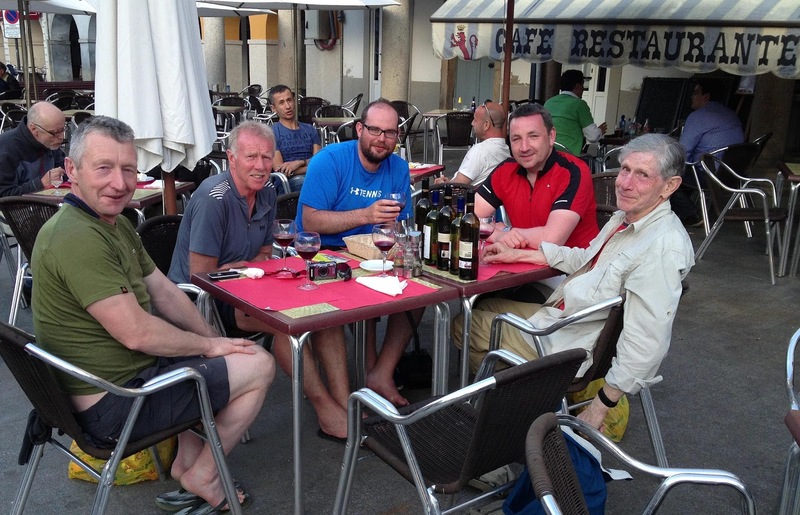 You might find yourself the only woman amongst a group of older Welsh gentlemen and a few Irish lads who tease you mercilessly and introduce you to the liquid diet of local wine and spirits, the wine bottles you've emptied now creating a wall in the middle of the table. Your most memorable dinner might be the homemade soup a dear fellow pilgrim made with carrots and beans she'd carefully carried in her backpack for kilometers. The soup is particularly memorable because you and your pilgrim companions are in an albergue whose only source of heat is a single-flamed gas space heater and you've entered its ancient stone walls, soaked, after a long day's walk in the pouring rain. As you sip your hot soup, which tastes exactly like love, you are treated to the sultry sounds of a pilgrim from Paris. A voluptuous, beautiful woman aptly named Anaïs, whose bright eyes sparkle and whose dark skin glows, loudly and passionately performs a hilarious version of Marilyn Monroe's 'My Heart Belongs to Daddy' to distract herself from the cold-water-only shower. You later find everyone gathered around the communal table in the albergue, huddled as close as possible to the tiny flame. Your chest is warm from the wine someone just brought out, and you slip alternating slices of foreign chocolate and local cheese a fellow Canadian pilgrim offered onto your tongue. You are perfectly content to watch Anaïs flip her hair and argue heatedly about love in a heady mix of Spanish and French. Arguing passionately alongside is Louis, a Spanish pilgrim whose eyes could benefit from yellow arrows and shells to guide you, as you've lost yourself repeatedly in their brown depths. 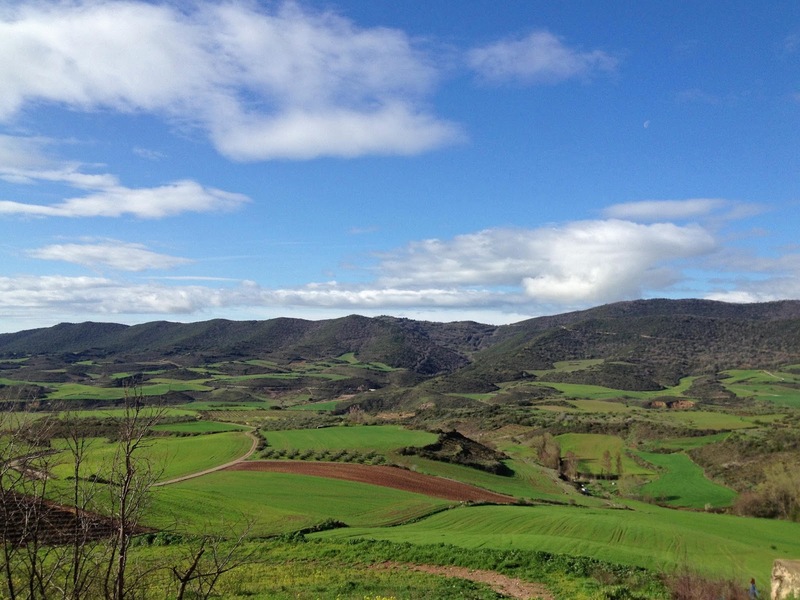 On the Camino, between the mind-blowing scenery, the abundance of delicious, local food, the endorphins from walking, and the open hearts of fellow pilgrims, you are in an almost perpetual state of falling-in-love - with yourself, with your pilgrim friends, with life itself. This feeling lasts despite the physical hardships; despite the emotional turmoil that arises after 35 days of spending time with your own recycled thoughts; despite the ways in which you still forget to let go. It lasts you that last week leading up to the cathedral in Santiago, the end of the pilgrimage. You stand in that large square and stare up at the gothic spires and feel a wave of emotion so intense, you feel you might explode with gratitude and love. 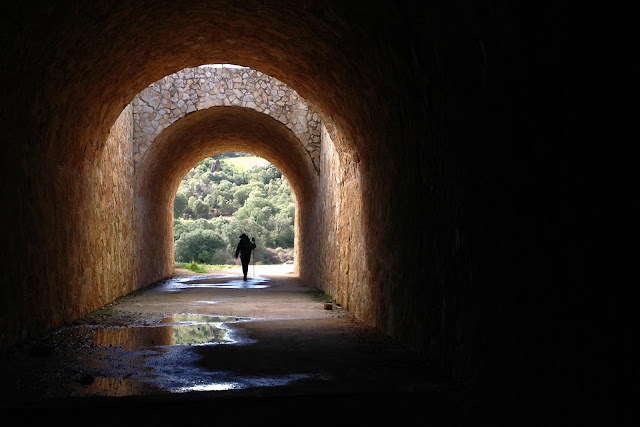 Your heart swells in acknowledgement of the journey and what it has meant to you - in that moment, you feel connected to every pilgrim that ever was and will be. 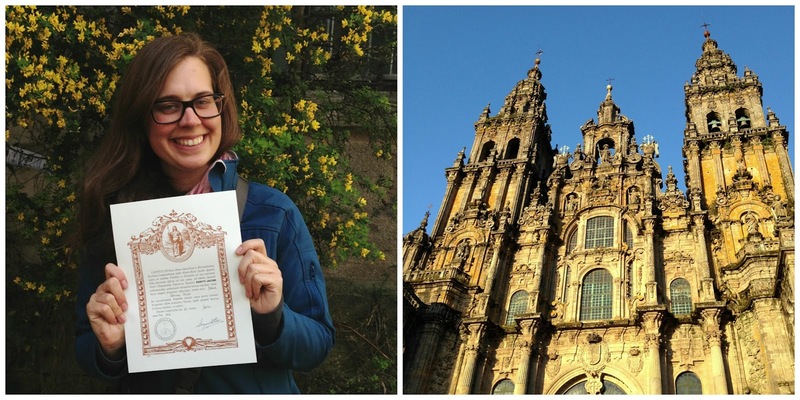 You spend a few days in Santiago, enjoying the ritual of greeting pilgrim friends who stumble, weary and awestruck into the square. You eat celebratory slices of Santiago cake and discover the heady high of 43 (Cuarenta y Tres) - a thick, syrupy liqueur that tastes like liquid butterscotch and brings out your silly side. You sadly settle in for your last night with the latest Camino family you've adopted - in this case, two handsome Belgians and a mother and her incredible 10 year old daughter from Australia. And this last night, despite its sentimentality, is like so many others on the journey - a room by turns stuffy, by turns ice cold. Always a European with a strong snoring issue. Always a few whispers in a language you don't recognize. Always the smell of whatever everyone had for dinner. Creaky bunk beds; mattresses of varying thickness and comfort; but also the for-once-not-taken-for-granted pleasure of lying down, limbs blissed out from exploring this path that leads you across an entire country and into yourself. 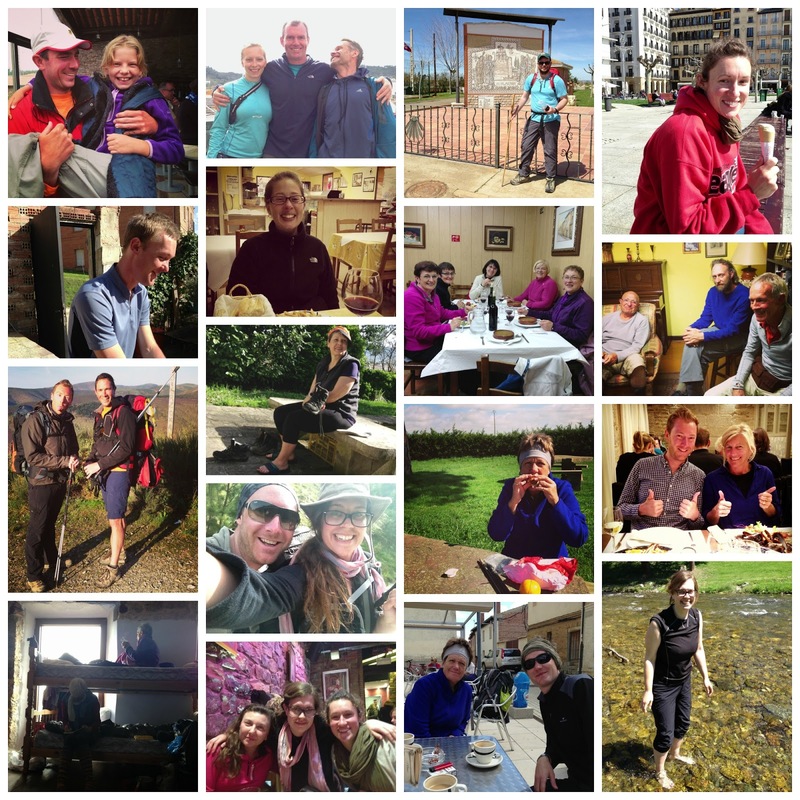 Missed Part 1 of Trail of Crumbs: Feeding Body & Soul on the Camino de Santiago? Read it here!